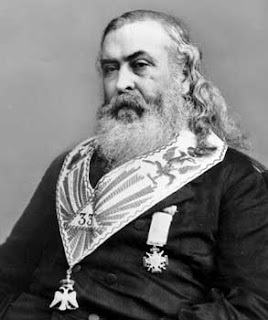 Albert Pike was Sovereign Grand Commander of the Supreme Council of the 33rd degree and Supreme Pontiff of Universal Freemasonry. He created the 33rd degree of the Scottish-Rite, co-created the KKK (K=11th letter, 11x3=33), and remains a revered figure in global Masonry. In 1891, when Pike died his funeral was held in the Washington D.C. Freemasonic Temple at midnight with the room draped entirely in black. This is a man who wore a wristband through which he claimed to maintain constant communication with Lucifer. On August 15th, 1871 Albert Pike wrote a letter to Giuseppe Mazzini outlining three world wars that would be necessary to bring about world government. The first two happened precisely as Pike had planned decades prior, and the third eerily resembles the current world political situation. "The Second World War must be fomented by taking advantage of the differences between the Fascists and the political Zionists. This war must be brought about so that Nazism is destroyed and that the political Zionism be strong enough to institute a sovereign state of Israel in Palestine. During the Second World War, International Communism must become strong enough in order to balance Christendom, which would be then restrained and held in check until the time when we would need it for the final social cataclysm. The Third World War must be fomented by taking advantage of the differences caused by the ‘agentur’ of the ‘Illuminati’ between the political Zionists and the leaders of Islamic World. The war must be conducted in such a way that Islam (the Moslem Arabic World) and political Zionism (the State of Israel) mutually destroy each other. Meanwhile the other nations, once more divided on this issue will be constrained to fight to the point of complete physical, moral, spiritual and economical exhaustion…We shall unleash the Nihilists and the atheists, and we shall provoke a formidable social cataclysm which in all its horror will show clearly to the nations the effect of absolute atheism, origin of savagery and of the most bloody turmoil. Then everywhere, the citizens, obliged to defend themselves against the world minority of revolutionaries, will exterminate those destroyers of civilization, and the multitude, disillusioned with Christianity, whose deistic spirits will from that moment be without compass or direction, anxious for an ideal, but without knowing where to render its adoration, will receive the true light through the universal manifestation of the pure doctrine of Lucifer, brought finally out in the public view. This manifestation will result from the general reactionary movement which will follow the destruction of Christianity and atheism, both conquered and exterminated at the same time." -Albert Pike in a letter to Giuseppe Mazzini, excerpt from William Carr’s “Pawns in the Game"
Incidentally, Freemasonry itself is a fascinating subject and I could devote an entire website to it. Simon Gray, a Freemason, has compiled a stunning amount of information on Freemasonrythat I recommend for anyone who wants to learn more about it. 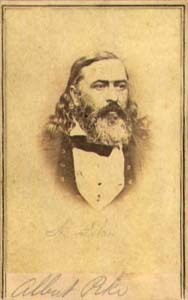 Albert Pike made his mark before the war in Arkansas as a lawyer and writer, but as a Confederate Brigadier General, he was, according to the Arkansas Democrat of July 31, 1978, a complete "WASH-OUT," not a hero. Yet, Gen. Albert Pike is the only Confederate general with a statue on federal property in Washington, DC. He was honoured, not as a commander or even as a lawyer, but as Southern regional leader of the Scottish Rite of Freemasonry. The statue stands on a pedestal near the foot of Capitol Hill, between the Department of Labor building and the Municipal Building, between 3rd and 4th Streets, on D Street, NW. More background on the colorful history of the statue can be found at the Masonic Info website. During the 1992 presidential campaign, Lyndon H. LaRouche and his vice presidential running mate, the Reverend James Bevel, launched a mobilization to remove the statue of General Albert Pike from Washington, D.C.'s Judiciary Square. On February 1, the campaign drew an angry attack from freemasonic leader C. Fred Kleinknecht, who attempted to defend both Pike and the Ku Klux Klan from LaRouche and Bevel's attack. A speech by Anton Chaitkin entitled 'Why Albert Pike's Statue Must Fall' can be found here (September 21, 1992). Adam Weishaupt (1748 - 1811) formed the Order of Perfectibilists on May 1, 1776 (to this day celebrated as May Day throughout many western countries), which later became known as theIlluminati, a secret society whose name means "Enlightened Ones". Although the Order was founded to provide an opportunity for the free exchange of ideas, Weishaupt's background as a Jesuit seems to have influenced the actual character of the society, such that the express aim of this Order became to abolish Christianity, and overturn all civil government. If you found this article interesting and want access to other carefully researched and well written articles, you might want to see what others are saying about the ThreeWorldWarsnewsletter. Albert Pike Defense: Defenses of certain Pike assertions taken from Walter Lee Brown, Professor Emeritus of History at the University of Arkansas at Fayetteville and his book "A Life of Albert Pike," published by the U. of Arkansas press, 1997. This sensational new analysis of the Masonic brotherhood examines the basic question asked for almost 300 years by the general public and surprisingly by many masons themselves; ‘If Freemasonry is simply a fraternal and charitable organisation, why is there an almost fanatical obsession with secrecy and mysterious rituals?’ E-book. Layout of Washington D.C. and discussion of how President Andrew Johnson considered himself to be the subordinate to Albert Pike, the leader of North American Freemasonry. Looking for pictures of Albert Pike? Masonry of Adoption: Masonic Rituals for Women Complete With the Verbatim Degree Lectures and the "Secret Work"
“ISRAEL ACTUALLY PLANS TO EXTERMINATE THE ENTIRE ARAB, MUSLIM POPULATION OF THE WORLD. THEY SEE, READ, HEAR, BUT RARELY LISTEN! This is not a conspiracy! Many good intentioned and like minded people, especially those disillusioned with the Christian established religions and of “Jeyyyyysus”, the real “lost sheep of Israel”, got together or each one on his or her own, have been trying to push a new Mayan-Hindu or Vedic type religion accompanied with more or less similar concepts seemingly based on empirical western science, but which is yet more often of an ambiguous or twisted nature. They do not automatically agree with each and every concept they are pushing forward and which by the way is not new at all. Their logic and rationale are too often littered with the issues they had or still have with the Christian religion and its Eastern and Western dictatorial establishments. Some, after claiming to have been struck by lightening or enlightenment, literally or not, are willing to admit that before, for decades they had no idea, no focal point and no paradigm, and that now they are in contact with another world unknown to most of the people of religion, which of course is erroneous. They are convinced they are the only people on earth who have realised that there is that thing called consciousness, energy, vibration and waves, the Spirit world or the ether. They claim to be themselves creators, gods and also masters of their own destiny. Yet, this concept is not shared by everybody in their midst. Although most of the issues they raised are aimed at Christianity, the Bible and the Vatican and its Popes and Monarchs, they make the colossal mistake of concluding that Islam has the same flaws as Christianity and they make the absolutely ridiculous and false claim that Islam is an established religion like, for example, Roman Catholicism, and as flawed. Although there is much that we can learn from those researchers after truth, many of them are as blind as many people of the religious faith. Involved in this quest for the truth and mainly as deniers of the validity of Islam and Christianity granting both of them no legitimacy whatsoever in the affairs and welfare of humans except for an alleged agenda of mind control, which, although is true for established Christianity, is not at all applicable to Islam as there is no coercion in Islam and there is no priesthood to dictate their will to anybody. Jordan Maxwell says tat the most evil Syndicate of Crime in the world is the Christian Church, both Catholic and Protestant. This seems outrageous and far-fetched, but I can prove this to be the case. Jews did not invade and steal Palestine and monopolise and own almost everything on planet earth! THEY WERE MADE TO INVADE AND STEAL PALESTINE AND MONOPOLISE AND OWN ALMOST EVERYTHING ON EARTH! As to why and by whom, this has been crystal clear to me for quite some time, but not to most people. Christian America cannot send Trotsky to Christian Russia and make the Jewish Bolshevik Hordes mass murder millions of Christians and Muslims, and we blame only the Jews! Christian America cannot give the Jews of the private Federal Reserve Bank the monopoly on money printing and then we blame everything on the Jews! Christian South Africa, USA, North America and Europe cannot arm Apartheid Israel and then we blame this on the Jews. Christian America cannot fraudulently elect a Crypto or pro-Jewish President and Christian France cannot fraudulently elect a Jewish President and Britain cannot fraudulently elect a Jewish or pro Jewish (Freemasonic) Prime Minister and we blame only the Jews for all the wars they are themselves carrying out around the world under the pretext that they are fighting so-called Islamic terrorism and under the false and outrageous pretext that they are committed to protect until the end of times the security of Israel. It can easily be proven that the HANDS behind all this are JEWISH but the HEADS ARE DEFINITELY CHRISTIAN and the ETERNAL FOOLS the Muslims! INTERESTING READ....... ALL CONNECTED SOMEHOW????? ?